During this winter season, please ensure that your child is dressed appropriately for the weather at all times. 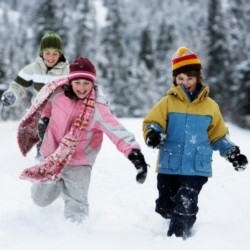 Warm slushy days require a change of clothes for those kiddos that love to play in the slush/snow. Cold days are more obvious as to what to wear. Send your child prepared and we will do our best to make sure that they are wearing what they need to be! Let's work together to make sure your kiddos are happy and healthy. See below for some general information regarding winter wear. Inner Layer: Wear fabrics that will hold more body heat and don’t absorb moisture. Wool, silk, or polypropylene will hold more body heat than cotton. Insulation Layer: An insulation layer will help you retain heat by trapping air close to your body. Natural fibers, like wool or goose down, or a classic fleece work best. Outer Layer: The outermost layer helps protect you from wind, rain, and snow. It should be tightly woven, and preferably water and wind resistant, to reduce loss of body heat. Stay dry—wet clothing chills the body rapidly. Excess perspiration will increase heat loss, so remove extra layers of clothing whenever you feel too warm. Also, avoid getting gasoline or alcohol on your skin while de-icing and fueling your car or using a snow blower. These materials in contact with the skin greatly increase heat loss from the body.